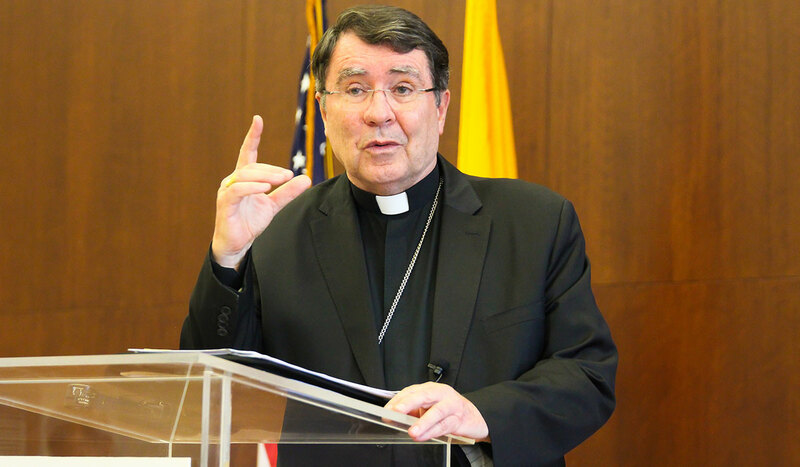 Archbishop Christophe Pierre, the apostolic nuncio to the United States, gave an address entitled “Synodality and Pope Francis: The Church that Walks Together” at The Catholic University of America this week, during the School of Canon Law’s 11th annual Frederick R. McManus Memorial Lecture. The archbishop, who was born in France, previously served as apostolic nuncio to Haiti, Uganda, and Mexico, before being appointed to his current role by Pope Francis in 2016. During his Nov. 2 lecture, he defined synodality as “a way of living the faith” that involves speaking honestly and listening with humility. By keeping those principles in mind, members of the Church can remember to work patiently — without becoming discouraged by conflict or distracted by idealism — for solutions that consider the realistic needs of everyone, from those in the pews to the highest Church leaders.